Full size prints are produced in limited editions of 10. Each print is initialed on the front right corner. The back of the mounted print is labeled with the edition number and Robert’s signature. Half size prints are open editions. All of the limited edition photos are printed on Fuji Crystal Archive Flex. This is a premium quality, archival, high gloss printing material and has the highest permanence rating of any chromogenic paper today. This material is a popular choice among photographers for exhibition purposes. The limited edition prints are face-mounted with conservation grade 1/8″ OP3 plexiglass and backed with a substrate of 1/8″ Dibond. A tubular aluminum frame recessed in from the edge of the print is mounted on the back of the Dibond to prevent warping and ease hanging the artwork. The frame gives the viewer the impression of the print floating off the wall. 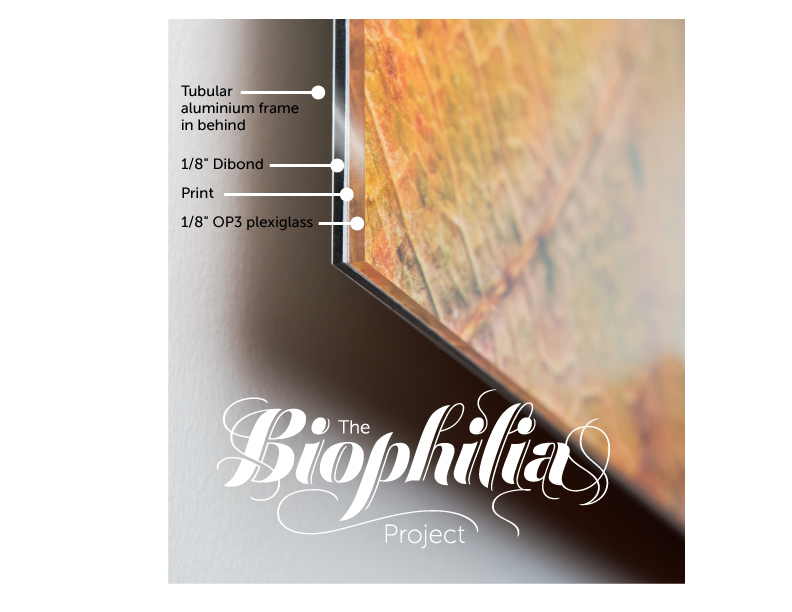 The plexiglass adds a three-dimensional, gem-like quality to the prints. Please see the photograph at the bottom of this page for clarification. You may also choose to purchase smaller prints unmounted. They will be rolled and shipped in a heavy cardboard tube ready for mounting/framing. A beautiful 65 page hardcover book of Robert’s work, 2012-2016 is available upon request. The book measures 32 X 28 cm.